Living on a barrier island has all the romantic charm advertisers have touted for years. Beneath the lure and charm, and just beneath the surface of the sand, lies the harsh infrastructure problems of developing and maintaining the water and wastewater systems that will affect the daily lives of all who choose to inhabit the island. The citizens of Mustang Island, through persistence and hard work, have created a water and wastewater system which reflects their will to live comfortably in an island environment. It has not always been so comfortable. This narrative is intended to put into perspective what has happened over the past 75 years in the island’s march toward assuring its citizens of an adequate supply of drinking water and an environmentally responsible management of wastewater. It is not the intention of this writing to be totally precise, but rather, to gather documents, statistical information, and transcribed interviews into one source that may be used as a guide when one wishes to account for what happened and who was involved in the development of the Nueces County Water Control and Improvement District No. 4. Much of what is reported in this account would not have been possible without the help of Ted Mathews, Henry Studeman, Don Roy Farley, Nona Sherrill, Melvin Littleton, George Hawn, Jim Urban, and the staff of the Water District. This project was conceived by District Manager Nona Sherrill with the hope that as the 40th Anniversary is observed, the District’s history and some of its successes can be preserved and shared with the community. Until the late 1920’s water supply was strictly an individual effort. The island’s population was in the low hundreds and each home had to supply its own needs. There was never a problem of water supply. Water wells could be installed rather easily as the supply existed only a few feet below the surface. What was in short supply was good drinking water. Some of the island’s population relied upon cypress cisterns to collect rainwater for drinking. A few who happened to be lucky enough to be located in the right areas found a supply of potable or drinking water about seventeen feet below the surface. Although the water was drinkable, it contained considerable amounts of minerals and was often brackish. There were several windmills used to pump water on the island during this period. The ground water supply was unpredictable at best. It rested atop salt water and was easily affected by the demand placed on the supply and the ocean tides. This uncertain fresh water supply situation was a constant question in the lives of the island’s earliest citizens. It was a time when the water supply for cooking, drinking, and cleaning was a daily problem. Washing clothes was extremely difficult. The mineral laden water was so hard that soap refused to suds and white clothing became dingy after being washed. It was a time that forced people to live by thrift and respect for the environment they chose to inhabit. This method for attaining water was prevalent until 1928 when an enterprising entrepreneur named Gayle Borden Munsill began what could best be described as his own utility company for the island. Mr. Munsill established the electricity, water, ice, and telephone services for the town of Port Aransas. The maintenance facilities for these services was located on Avenue C where the present-day Telephone Company maintenance building is located. It is probably of interest to note that this original area is still the same area in which the water and telephone offices are today. The original office building is still in existence as a residence and is located on the southwest corner of Avenue C and 9th Street. For the water supply of the Munsill operation, a series of wells were located around the island and a collection system was constructed. One group of wells was located near the large white dune area near the present home of Glenn Belcher (east end of Oakes Street). Another was located near the Oscar Gillespie home (near Palm and 11th Street). Wells and pumps were also located near Lantana and 11th Street. The original wells and pumps located near the Belcher home were the last to be abandoned. There was nothing sophisticated about this first water system. Well points were put down to a depth of approximately eighteen-feet. There were as many as one hundred points in each well “field.” These were interconnected with galvanized steel pipe and then connected to two large pumps which moved the water to an elevated wooden storage tank. The pumps also pushed the water through the two- inch distribution system throughout the town. The well sites were a favorite play area for the island’s children who challenged each other to see who could successfully walk the raised maze of pipes without falling off. There did not appear to be an overall plan as to which line would be laid when or where, other than the obvious dictate of need. If the line came by your house and you wanted to tie-on, you did so for a fee of three dollars. There were no meters and no monthly billing for the water used at this time. The Munsill system was functional and was the island’s first organized attempt to provide water service, but the success of the system began to fail in 1937. The water supply was not able to support the island’s demand due to the population and development growth and often the water became very salty. It was becoming apparent that the ground water of Mustang Island could not continue to provide an adequate water supply to meet the needs of the growing population of Port Aransas. As a result, the City of Port Aransas decided to purchase the existing water distribution system from Mr. Munsill. This became the first attempt by the local government to provide water services for its citizens. The City’s water operations were conducted at the same location Munsill had used at the corner of Avenue C and 9th Street. Working in the City’s utility office at that time were Boone Walker and Ted Mathews. The City continued to operate the old Munsill system but knew that a new off-island source of water would have to be found to meet the community’s present and future water requirements. 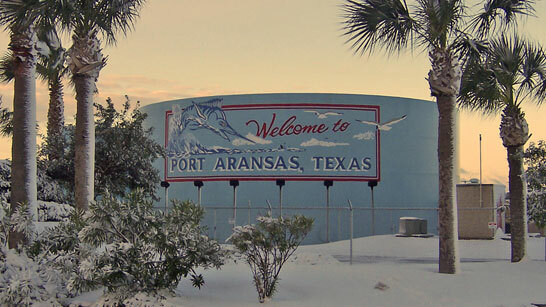 During this period, the Aransas Dock and Channel Company (a Clint Murchison Company) owned and operated the Harbor Island Causeway, the ferry system and a four-inch water line which supplied water from Aransas Pass to Harbor Island which was located across the channel from Port Aransas. This was the closest off-island water source. A progression of steady growth after World War II resulted in the construction of a causeway from the community of Flour Bluff to Padre Island. This new southern access to Mustang Island threatened the monopolistic position of the Aransas Dock and Channel Company and they decided to sell the company to the Nueces County in 1951. The sale was financed by a $250,000 bond issue voted on by the constituents of the Nueces County Road District No. 4. Melvin Littleton, Superintendent for the Road District, was placed in charge of the run down water line which provided water to Harbor Island. He was directed to improve the system as best he could with as little bother to the County as possible. Mr. Littleton extended the water line from Harbor Island across the channel to the Port Aransas side. The water line was pulled across the ship channel by the Port Aransas ferryboat and a 10,000 gallon storage tank was put in place at the ferry landing. 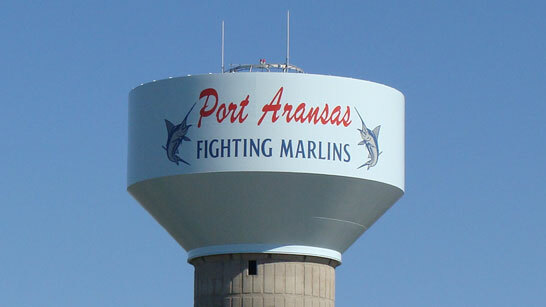 Thus, the first potable or drinking water was available in Port Aransas from an off-island source. This eased the pressure on the City water system because there was always a drinking water supply available to those who would carry a container to the ferry landing and fill it for their needs. The storage tank was obtained by Mr. Littleton from a construction site on North Padre Island and hauled to Port Aransas on a wagon trailer that was later used as a Port Aransas Roundup Days parade float. It was on this same trailer that Nona Sherrill, the current District Manager, rode on as a young lady when she and eight other young ladies from the island represented the City of Port Aransas as the “Tarpon Capital of the World”. The County water line fulfilled the most basic of drinking water needs but hauling the water form the ferry landing to home continued to be a problem. The City system of providing non-drinking water to the citizens of the community became a never-ending battle of supply and demand. An added problem of the City water was its high mineral content which was very abrasive on all machinery and to water heaters, in particular, which had to be replaced every few years. To overcome these problems and raise living standards to that level enjoyed by other communities, the citizens sought and were granted authorization from the State of Texas to form a water district which would replace the systems being operated by the Nueces County Road District No. 4 and the City of Port Aransas. The state charter for the Nueces County Water Control and Improvement District No. 4 was granted in November 1952. The District purchased the water utilities from the City of Port Aransas in 1958 and in effect assumed all responsibilities for the water needs of Mustang Island and Port Aransas. The reader of this narrative will discover what occurred over a forty-year period which brought the District from its humble beginnings in 1952 to a well planned and financially sound system fulfilling the most basic infrastructure needs of Port Aransas and Mustang Island. The District went through three phases of development; the beginning years, 1952-1962: early development years, 1962-1977; and present business management years, 1977-1992. The following chart will show the contrast between the District’s beginning statistics and what is in place today. The Nueces County Water Control and Improvement District No. 4 began with 300 accounts serving a population of approximately 1000. The system was purchased from the City of Port Aransas in 1958 for $78,500. The first thing the District did was set a priority for additional water supply. Without an adequate supply, the District could not fulfill its most fundamental service. The District’s first directors (see list included) knew that one four-inch line from Harbor Island could never supply the island’s future water needs. Thus began an almost 20-year period of negotiating, issuing bonds, and planning to ensure the island’s future needs. In the first year after the District was formed, an engineering study was made to project the District’s future water needs. This study proposed construction of an eight-inch water line from the north end of Padre Island to Port Aransas. This proposal was not accepted by the District for a number of years. Instead, the District chose to bring an eight-inch water supply line from San Patricio Water District through Aransas Pass under the ship channel to Port Aransas. To understand the Board’s thinking, one has to reflect on what existed at that time. First, water was already coming to Port Aransas from Aransas Pass and the water supply source was closer from Aransas Pass than from North Padre Island. The line proposed in the engineering study was to come up the island in the Park Road right-of-way and would be connected to a 300,000 GPD line built by Nueces County Water District No. 2 for the Padre Park area. The park road had not been constructed at this time. It was estimated that the park area would not need near the capacity of its supply line and that Port Aransas could possibly receive up to 200,000 GPD from this supply. But, there was a catch. If the demand for water increased on the north end of Padre Island and the Flour Bluff area, the Port Aransas supply would be cut back. The decision by the Board to accept the proposed eight-inch water line from Aransas Pass set a pattern for supply that was to be followed until 1977 when the District completed the supply line from North Padre Island. The District signed the first water supply contract with San Patricio Water District in 1958 and received its first billing in November of 1959. To pay for the water billed to the District, a user’s fee of $2.00 per 2,000 gallons was set. The District’s first personnel were Gail K. Holman, the maintenance superintendent and Letha Manchen, the office manager. The first employee hired by Gail Holman was Rudy Vela. Mr. Vela was working with the company contracted to lay the eight-inch water line from Aransas Pass when he was hired. He now has twenty-five years service and is the Superintendent. With a contracted supply, storage and delivery capacity planned, the District would undergo all of the growth and maintenance problems associated with a developing system. For the next 10 years the District was “in the ditch.” It was a time when lines had to be laid, repaired, fixed, storage capacity constructed, and daily water needs met. What was probably the most frustrating to those involved in the District at this time was all work with little or no time for planning. All of the beginning work by the District was within the budget of the first two bond issues totaling $715,000. A list of the bond issues is included here for the reader to follow this timeline. 1958 – $590,000 Original Bond Issue. 1961 – $125,000 Water improvements. 1962 – $535,000 Wastewater Treatment plant. Land bought from the City. 1966 – $145,000 One million gallon water storage tank and pump station at Port Street and other water and sewer improvements. 1969 – $860,000 Additional 12-inch line from Aransas Pass (under channel). 1971 – $240,000 Addition to WWTP and sewer laterals and lift stations. 1972 – $25,000 Sewer improvements. 1974 – $300,000 A 20-inch water line under channel to elevated tower. 1977 – $750,000 Mustang Island Water Line. 1978 – $1,935,000 Upgrade water and sewer lines throughout the District and construction of 1.500,000 gallon storage tank on Hwy 361 in 1982. The early years for the District are distinct from the initial demands of the beginning years as the basic supply and delivery system was in place. The years of 1962-1977, were faced with the changes in population and thereby the need for increased water supply and storage and the construction and addition of wastewater treatment for the island. During this 15 year period much upgrading and many additions were made. By the early 1960’s, the population had increased enough that the members of the District recognized the problem with wastewater, and in 1962 passed a $535,000 bond issue to construct the original wastewater treatment plant. Land at the end of Ross Avenue was purchased from the City and a 600,000 GPD treatment facility was constructed. This facility served the island’s needs by utilizing a network of lift stations spread throughout the island. 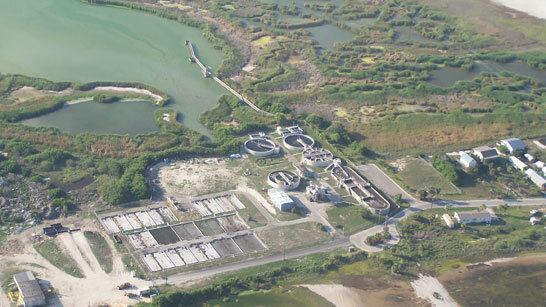 Wastewater management on a barrier island is an expensive process and must be maintained properly to accommodate the environmentally sensitive surroundings within which it operates. The bond issues listed previously attest to the activity of the District during this time. At the end of this period, the District was still experiencing some of the same problems that plagued it from the beginning: how to get an adequate infrastructure in place and at the same time keep up with changes taking place on the island regarding development and population. The property south of Island Moorings is the remainder of 8,000 acres owned by the Wilson family of Corpus Christi. In the early to mid 1970’s Mrs. Wilson decided to sell the land for $1,000 an acre. An effort was made by a South Texas Group to convince the State Parks and Wildlife Commission to purchase this land for a State Park. The State was able to purchase only 4,000 acres which became Mustang Island State Park. Mrs. Wilson sold a portion of the track to a developer, Jack Modisette of Great Western Development Corporation, to develop and sell the remaining eight miles of property between the State Park and Port Aransas. All of the beachfront property, with the exception of two small portions bought by Edwin Flato, were subdivided into approximately 67 tracts of 12 acres each and put up for sale and development. Mr. Flato purchased a large section of the property on the bayside of the island and smaller portions on the gulf side. Now a major area of the island was ripe for development. The District was responsible for servicing the water and wastewater needs of anyone in this area requesting service. The District was approached by Mr. Modisette with a proposal as to how this area could be served water and wastewater. The Modisette proposal required the developer to install a water and wastewater line to connect to the District’s system, build a mid-island elevated water storage tank, and pay the District $80,000. The bottom line was the developer was to pay about $500,000 for infrastructures servicing eight miles of property. Mr. Flato did not join with the Modessette proposal and instead planned to use desalinization for his property. What was actually created through all of this developer maneuvering was large pieces of property were brought into the District and at the same time, large pieces of Flato property were excluded. It also shows how the original dividing line within the ETJ of the State Park’s north boundary line was accepted as the beginning of the remaining property’s jurisdiction. This is where the District’s storage tanks are located and the District’s pumping responsibilities take over. Corpus Christi has exercised no governmental control over this area. 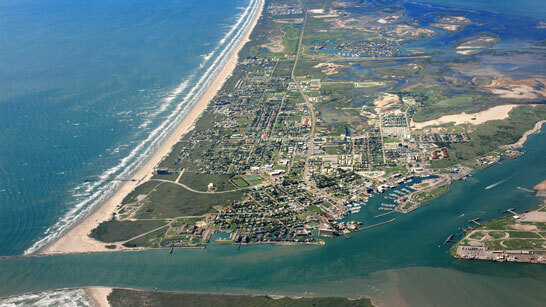 The District the City of Port Aransas have provided development control and services to this area since its development. What is characteristic of this period of development for the District is that all of the elements (supply, distribution, wastewater treatment and disposal) are in place and the business of the District turns toward effective management and planning practices. With the construction of a sixteen-inch water supply line up the now- constructed park road, the District was virtually assured of an adequate supply for years ahead. A long debate about the best way to satisfy the island’s water supply needs, from Aransas Pass and under the ship channel or to come up the park road from North Padre, was settled with the island being served by two water sources, Corpus Christi and San Patricio. This dual supply system has many advantages and the island’s water system is better equipped to handle the District’s needs because of this configuration. It is probably a Port Aransas characteristic that through disagree-ment we gain strength. Perhaps the most significant event that allowed the District the opportunity to take control of its future and the future of the island’s natural resources was implementing the Capital Recovery Fee. By the end of the late 1970’s, after ten bond issues, several disagreements, and a lot of hard work, most of the present system was in place. The early 1980’s produced a boom in island development. It was a boom in small and large projects. The District was concerned that the members of the District had spent 20 years getting the water and wastewater systems up to respectable standards and now the tremendous surge in growth placed additional, heavy demands on both systems, that would at times overload their capacities. The District decided that a Capital Recovery Fee would be collected before any new project was added into the system. This fee would be used to help pay for enlarging or increasing the systems the taxpayers of the District had already financed through ten previous bond issues. It was a “pay as you go” system that few Districts or utility companies throughout the state used Today, with dwindling available grant monies and high taxes, most of the cities, districts, and utility companies have adopted this same approach. About the only change from what was developed by the District and what was approved by the Texas Water Commission is the name. Instead of Capital Recovery, the Commission wanted the term Capital Impact Fee. Impact is probably a more accurate term because that is exactly what the fee is designed to do, offset the impact a project may have on the total integrity of the system. The Texas Water Commission requested the District’s Capital Impact Policy, developed by its Board of Directors, to use as one of the first models for other districts to copy. This fee is probably one of the main reasons why improvements and expansions continued through the 1980’s and early 1990’s without any bond issues. It’s the only decade since the District began that has not had a bond issue. Improvements, such as the expansion of the North Wastewater Treatment Plant in 1987-1988 to a capacity of 1,400,000 GPD, may be directly accountable to the fact that the District had capital impact funds available to obtain a matching EPA Grant. The grant plan called for the facility to be expanded and be able to handle two hour peak demand flows (large holiday crowds) of up to 4,140,000 GPD. The project costs of $1,800,000 was done without a bond issue. Actual capital impact dollars spent on the expansion were at a cost of $0.55 per each dollar for the total cost of the expansion. The District is one of the few which have already planned and permitted for future wastewater needs. The mid-island treatment plant with a capacity of 2,200,000 GPD has been permitted since the late 1980’s, and when the demand is there, the District will be able to fulfill its obligation for service. The present management approach taken by the District is one which calls for planning and permitting before the need. It is this approach that distinguishes the present day District from its beginning and during the early years of its development. It has also allowed the District to take formidable roles in the future of the island, construction standards on the island, and the protection of the island’s natural resources. To keep up with increasing water quality standards and permitting, the District has actively participated in the state’s education and certification programs for all its employees. The District currently employs seventeen people including clerical. Fourteen of the seventeen employees are licensed by the State of Texas as water and wastewater operators. This overview of the development of the District covering the past 40 years exhibits that the island and its people are adequately served by an entity that developed in a relatively short period of time. The District is well managed, fiscally responsible, and sensitive to the island environment and its natural resources. It is a district that is as strong as the people who forged it from a salty, brackish system into one of the state’s best run water control and improvement districts.